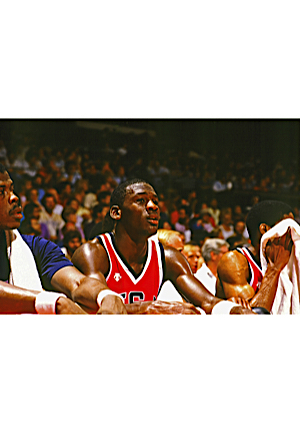 The 1984 United States men's Olympic basketball team took home the gold medal during the Summer Olympics located in Los Angeles, California. Coached by Indiana University legend Bob Knight, the 1984 team was the last amateur United States team to win an Olympic gold medal in men's basketball. 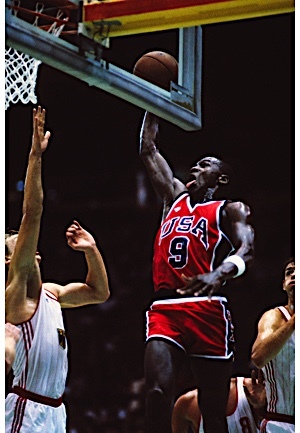 The team featured four of the five 1984 consensus first team All-Americans, including the greatest to ever play in the NBA, Michael Jordan. Without much competition the team went a perfect 8-0 during the tournament, averaging 95.4 points per game and holding their opponents to 63.3. 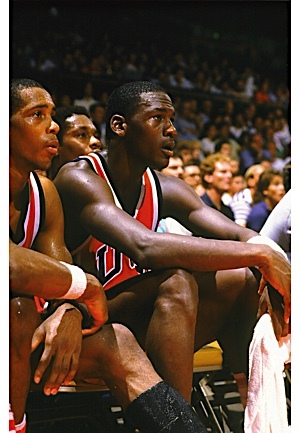 Jordan was one of four players that averaged double-digit points with 17.1. 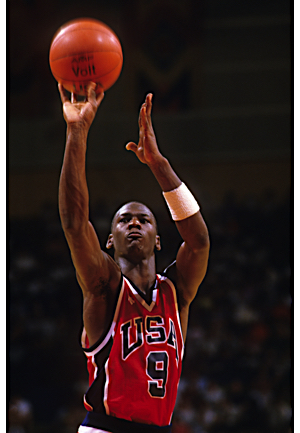 Along with capturing a National Championship at the University of North Carolina, that Summer Olympics was Jordan’s introduction to basketball fans worldwide. On the left inseam is a materials tag with washing instructions. 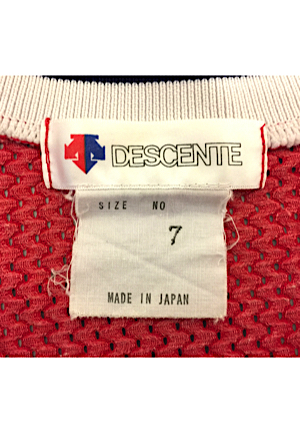 On the inside below the rear collar is a “DESCENTE” manufacturer’s tag and below is a tag that reads, “SIZE NO 7 MADE IN JAPAN”. On the right chest is a Descente logo in white heat-pressed vinyl. Across the chest reads, “USA” and the player number “9” appears on both the front and on the back. 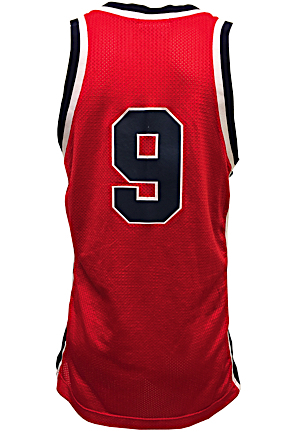 These are done in navy blue on white heat-pressed vinyl directly applied to the red mesh jersey. This jersey is properly tagged, was presented to us as game-used and in our opinion shows excellent use remaining in pristine condition. Accompanied by a LOA from PM&G grading the jersey a 10. 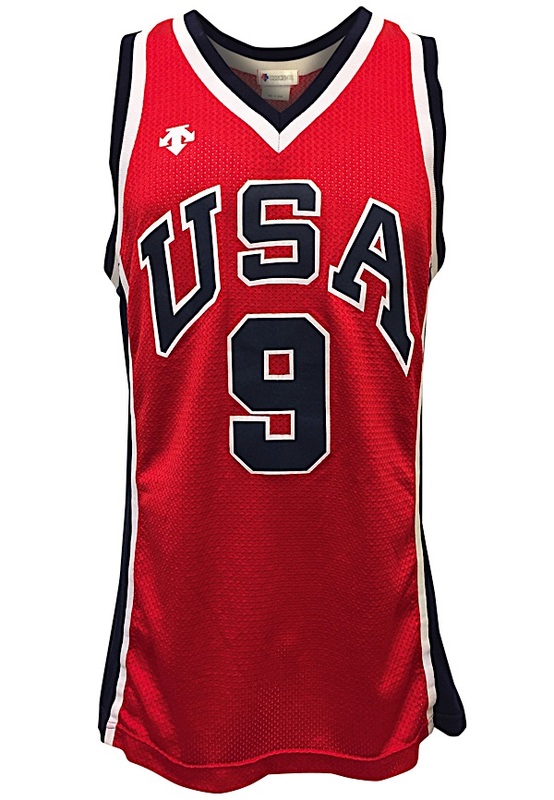 This jersey has been conclusively Photo-Matched to the USA Olympic exhibition games, the preliminary Olympic trials and progressively matched to actual medal play. 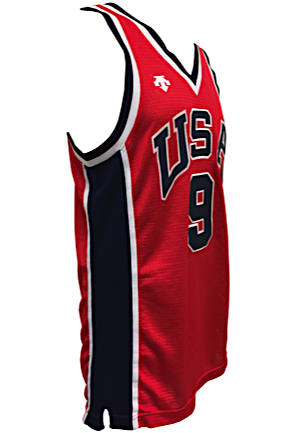 We believe this to be the only red color-way uniform that Jordan wore for this historic gold medal run. 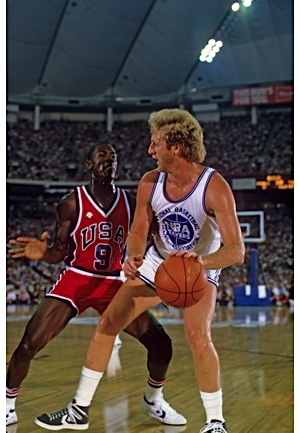 A museum level piece that stands alone as the only Photo-Matched Olympic Jordan known to exist and the earliest fully documented MJ extant. Auction closed on Thursday, June 22, 2017.